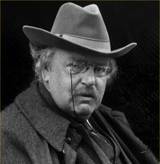 Read 52 Books in 52 Weeks: BW 11: G.K. Chesterton's "The Man Who Was Thursday"
BW 11: G.K. Chesterton's "The Man Who Was Thursday"
G.K. Chesterton, English author and critic, wrote over 80 books, many essays, poems, short stories and a few plays during his lifetime. He is probably best known for his Father Brown Mysteries and his novel The Man Who Was Thursday. When all church bells were silent our cap and beds were heard. THE suburb of Saffron Park lay on the sunset side of London, as red and ragged as a cloud of sunset. It was built of a bright brick throughout; its sky-line was fantastic, and even its ground plan was wild. It had been the outburst of a speculative builder, faintly tinged with art, who called its architecture sometimes Elizabethan and sometimes Queen Anne, apparently under the impression that the two sovereigns were identical. It was described with some justice as an artistic colony, though it never in any definable way produced any art. But although its pretensions to be an intellectual centre were a little vague, its pretensions to be a pleasant place were quite indisputable. The stranger who looked for the first time at the quaint red houses could only think how very oddly shaped the people must be who could fit in to them. Nor when he met the people was he disappointed in this respect. The place was not only pleasant, but perfect, if once he could regard it not as a deception but rather as a dream. Even if the people were not "artists," the whole was nevertheless artistic. That young man with the long, auburn hair and the impudent face -- that young man was not really a poet; but surely he was a poem. That old gentleman with the wild, white beard and the wild, white hat -- that venerable humbug was not really a philosopher; but at least he was the cause of philosophy in others. That scientific gentleman with the bald, egg-like head and the bare, bird-like neck had no real right to the airs of science that he assumed. He had not discovered anything new in biology; but what biological creature could he have discovered more singular than himself? Thus, and thus only, the whole place had properly to be regarded; it had to be considered not so much as a workshop for artists, but as a frail but finished work of art. A man who stepped into its social atmosphere felt as if he had stepped into a written comedy. More especially this attractive unreality fell upon it about nightfall, when the extravagant roofs were dark against the afterglow and the whole insane village seemed as separate as a drifting cloud. This again was more strongly true of the many nights of local festivity, when the little gardens were often illuminated, and the big Chinese lanterns glowed in the dwarfish trees like some fierce and monstrous fruit. And this was strongest of all on one particular evening, still vaguely remembered in the locality, of which the auburn-haired poet was the hero. It was not by any means the only evening of which he was the hero. On many nights those passing by his little back garden might hear his high, didactic voice laying down the law to men and particularly to women. The attitude of women in such cases was indeed one of the paradoxes of the place. Most of the women were of the kind vaguely called emancipated, and professed some protest against male supremacy. Yet these new women would always pay to a man the extravagant compliment which no ordinary woman ever pays to him, that of listening while he is talking. And Mr. Lucian Gregory, the red-haired poet, was really (in some sense) a man worth listening to, even if one only laughed at the end of it. He put the old cant of the lawlessness of art and the art of lawlessness with a certain impudent freshness which gave at least a momentary pleasure. He was helped in some degree by the arresting oddity of his appearance, which he worked, as the phrase goes, for all it was worth. His dark red hair parted in the middle was literally like a woman's, and curved into the slow curls of a virgin in a pre-Raphaelite picture. From within this almost saintly oval, however, his face projected suddenly broad and brutal, the chin carried forward with a look of cockney contempt. This combination at once tickled and terrified the nerves of a neurotic population. He seemed like a walking blasphemy, a blend of the angel and the ape. Gregory resumed in high oratorical good-humour....."
Ah, I enjoy G.K. Chesterton! I love Chesterton! Thank you for featuring him this week. 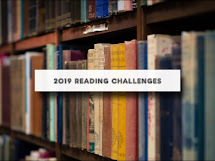 Finished book #14 "Austenland" by Shannon Hale and book #15 "Six Days in October, The Stock Market Crash of 1929" by Karen Blumenthal. Finished Callander Square by Anne Perry and The Mammy by Brendan O'Carroll.